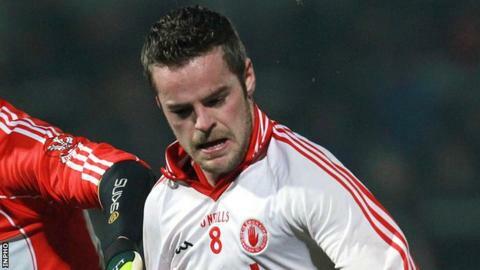 Mickey Murphy will make his first appearance of the season for Tyrone in Sunday's NFL clash with All-Ireland champions Donegal. Murphy, who has returned from a spell in Australia, will partner Sean Cavanagh at midfield at Healy Park. The versatile Conor Clarke moves from midfield to full-back, with Justin McMahon switching to the corner in place of the injured Conor Gormley. Mattie Donnelly replaces Plunkett Kane in the half-forward line. Kyle Coney is in line for his first appearance of 2013, having been included among the subs. Aidan Cassidy has been recalled to the squad to provide midfield cover, and he too will be on the bench. Gormley was injured in the win over Mayo last time out. Tyrone: N Morgan, A McCrory, C Clarke, Justin McMahon, R McKenna, Joe McMahon, R McNamee, M Murphy, C Cavanagh, P McNeice, P Harte, Mattie Donnelly, C McAliskey, S O'Neill, Mark Donnelly.